Stop me if you’ve heard this one: A service that pulls in your feeds from around the Web for you to read. A service that provides a storefront for discovering and subscribing to Web publications. A service that lets you follow updates from your favorite Web personalities. A service that personalizes the news for you based on your interests and friends. 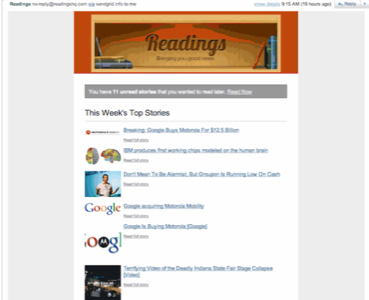 A service that emails you a digest of your top stories. A service that cleans up Web articles and presents them to you in a pretty interface. A service that lets you quickly save articles to read later. Now, name that service… Well wait, those each sound like the features of a different app you’ve heard of, maybe even used, don’t they? Google Reader, Apple and Amazon stores, Twitter, News.me, Flipboard, Read It Later. How many of these things do you use for reading? More than one? Now, imagine if you only needed one reading app. That’s what Adeel Raza, founder of Readings, imagines. “Our plan is to create a page that you have to open daily,” says Raza. He wants the features of Readings to allow readers fine-grained control over the torrent of daily information, so they can tune into all the info that matters to them and tune out the rest. “There’s so much information overload these days that you cannot keep up with all of it.” He adds that other aggregation apps (Flipboard is an example) offer separate screens for topical or source feeds, requiring users to jump around, whereas Readings offers one streamlined news feed. While this is surely not the first service to offer a news feed, it does allow users to mix and match the kinds of content that appear in the feed to their specifications, allowing them to follow topics, sources, or individual authors as they prefer. By offering these different ways of following content, Readings aims to provide the best one-stop reading shop with its news feed. Not only does Readings allow you to subscribe directly to publications, it automatically identifies individual authors from all the publications listed and lets you follow them personally. According to Raza, the site currently features 54,000 individual authors. The author feed includes the author’s posts to his or her main site, but it also draws in public posts from Twitter, Facebook and Flickr (with more services to come), making it a central location for any kinds of updates from that person. The ability to follow individual authors is a distinguishing feature, and it’s made possible by the inclusion of all the other feeds. Currently, Readings creates author feeds automatically by scraping the sites whose content it pulls in, which are themselves created based on popularity around the Web. Eventually, though, Readings wants authors to control and curate their own author feeds. “Our real plan is not to keep it automated forever,” Raza says. “Our real plan is for authors to be able to sign up there and own their own profile.” But the author page won’t be just another site for content creators to update. It will pull in their updates from Twitter and existing services. “We just want to complement the feeds that you have,” Raza says, by combining them all in one place. Raza says that Readings currently lists about 15,000 publications, and while it mostly just aggregates, it has more involved partnerships with some sites. For example, while subscribing directly to CNN.com feeds through an RSS reader only provides an excerpt, CNN and Readings have arranged to show the whole text. Currently, Readings doesn’t scrape content from paywalled sites, but eventually it would be able to feature them in the store after arranging a partnership. The algorithms behind the scenes do some nifty work to present the content attractively, even though it’s a largely automated process. For example, Raza says the algorithm for identifying a story’s key image can even find it in a frame of an embedded video if there’s no static image in the post.  The Read Later feature is one of the most ambitious features of Readings, since dedicated read-later services like Read It Later and Instapaper are so well-established. Those services are most valuable for their ability to save content from any Web page and cache it in a personal reading list for later, with all one’s collected reading available in one place. Readings offers a browser bookmarklet that offers the same feature, even for sites and publications not included in its database. Until the Readings mobile app launches, the other read-later services will have a leg up, but depending on how the app is executed, this could be a big move. Currently, one has to use other apps for finding reading material and save to the Read It Later or Instapaper service from there. 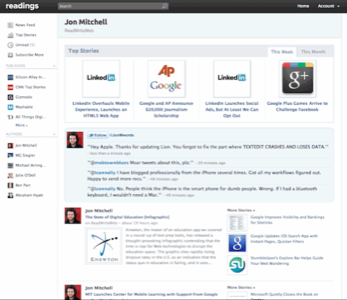 Readings can offer new content from feeds and saved stories all in one place. It also reminds users of unread items in the weekly email digest (you can turn it off), which Instapaper and Read It Later don’t do, so stories tend to quickly pile up there, if one isn’t dedicated about reading every day. The reading view. 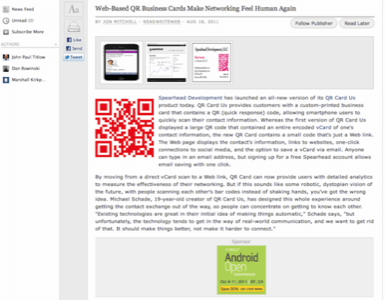 Note the interstitial ad is still displayed, which comes from our site. The one key feature where reading apps have to compete, though, is the visual reading experience itself. If it’s hard to read in an app, users won’t do it. That’s why services that improve the visual reading experience exist in the first place, since most content sites are so cluttered. Readings makes a concerted effort to make its content beautiful, converting all fonts to Verdana with adjustable sizes and arranging text in neat, squared-off paragraphs around embedded images. This only works for supported publications, though; saved pages from outside Readings will load in full within the Readings iframe. And the Web interface of Readings still has a ways to go to look as good (or be as customizable) as Read It Later and Instapaper, and there is no native tablet version yet. That will be a crowded market, too; in addition to the native Read It Later and Instapaper apps, Flipboard has put some advanced Web technology to work to create its layouts, and it allows publishers to customize their layouts for reading in Flipboard. 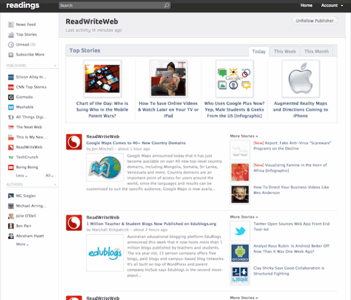 But for a first public version, Readings is an impressive reading solution, and anything that can reduce the number of apps and websites required just to read one’s daily articles is a welcome addition to the market. Interface improvements are less important than powerful underlying software, and Readings has that. Could it be enough to disrupt the personal reading space by rolling so many services into one? Time will tell. 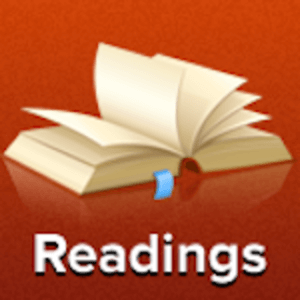 What apps, sites, or services do you use to manage your daily reading? Let us know in the comments.